Hu Fayun is an independent Chinese thinker and author whose themes are the human costs of his country’s revolution, the individual’s quest for integrity in the shadow of State power, and the redemptive value of art. 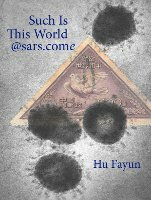 His 2006 novel Ru Yan@sars.come explores the moral dilemmas that result from the authoritarian control of information in a changing society. The work was banned in 2007 by the General Administration of Press and Publications, an office of the Chinese Government which later, under intense criticism both at home and abroad, denied issuing the ban. Born in January 1949 at a missionary hospital in Hubei near the close of the Civil War, Hu Fayun became an infant refugee when his family fled 500 miles to Chongqing. They returned to Wuhan, which would become the writer’s lifelong home, only after the new government was established. Growing up under the stifling regime of Mao Zedong, Hu Fayun was influenced by an uncle who collected books and magazines from the era before 1949 and had an affinity for European culture. Thanks to this uncle, Hu remembers listening to Swan Lake and seeing a picture of Michelangelo’s David when very young. The boy also became familiar with the work of Chinese writers from the May 4th movement, most of whom had by then fallen into disfavor or oblivion. In one essay, he recalls a seventh-grade teacher who lent him a volume of Pushkin with the warning not to tell anyone. This was his first literary conspiracy. At the age of nineteen, during the nationwide suspension of higher education that marked the Cultural Revolution, he was dispatched to a remote, impoverished village in the hill country of Hubei, where he planted rice and cotton and drove an oxcart laden with lime. In winter he was assigned to the crew digging the Hanbei canal, and subsisted on a diet of carrots and beans teeming with maggots. When on leave from the worksite, he was billeted with farmers or offered a tent made of straw matting. Once, when no such accommodation was available, he propped a large wheelbarrow against a wall and slept under it with three other men. The Cultural Revolution’s attempt to eliminate corrupting influences had unintended effects. The educated youth sent to live with farmers had little intellectual supervision. Foreign classics whose possession would have incurred punishment in town now circulated among these youths to the serene indifference of the illiterate farmers who were their hosts. Hu recalls poring over The Red and the Black and Anna Karenina by the light of a hurricane lantern as the most intense experience of reading he ever had. Deprivation enhanced his appreciation for music, too. Hu recalls visiting a friend in the city who had obtained a phonograph record of the Butterfly Lovers’ Violin Concerto, a 1959 composition by Chen Gang and He Zhanhao which was at that time under a ban. The only available record player had no working speaker, but the two young men played the record anyway, leaning close to the machine so they could hear the melody in the vibration of the phonograph needle. In 1970 Hu Fayun was pulled from the countryside to work in a repair shop for military vehicles. There he was trained as a welder, a trade he plied for three years. Later he collected statistics in the factory office and served on the staff of the workers’ union. When access to higher education was restored, he earned a degree in Chinese Literature from Wuhan University. In the 1980s Hu Fayun wrote short fiction and a collection of poems, but his experience of the Cultural Revolution made him distrust the social liberalization that was then being confidently celebrated. He read and reflected much, but published little. The crackdown of June 4, 1989 confirmed his doubts. Not until the latter half of the 1990s did he begin to write in earnest. A series of short stories and novellas quickly gained him a national reputation, signaled by the Hundred Flowers Prize and the Qu Yuan Literary Award, among others, and inclusion in Asia Week’s annual selection of the ten best works of Asian fiction. In recent years, he has lectured at universities, libraries, and for the radio on such topics as the politicization of art during the Cultural Revolution, the role of educated women in China at different historical epochs, and the impact of the market and State power on the work and attitudes of Chinese writers. In 2001, when he was appointed vice-chairman of the Wuhan Writers’ Association, he noted that the by-laws of the association made this an elective position; and since there had been no election, he declined the office. In 2006, shortly after the publication of Ru Yan, he withdrew from all the official writers’ associations of which he had been a member. He maintains a blog (in Chinese). Hu Fayun is currently working on his second full-length novel, the tale of a band of youths from bad “class backgrounds” who formed a traveling Propaganda Team during the Cultural Revolution. The description of an ordinary man’s spiritual life realized through dedication to music seems authentic. It makes me feel less cynical and gives hope for the future of the nation. The novel provides a meticulous in-depth depiction of contemporary Chinese social life, and is especially revealing of the complex attitudes of intellectuals and the mental tenor of society as a whole. Copyright © 2011 Ragged Banner Press. Best viewed with Mozilla Firefox.